It’s official: SkyTrain technology has been confirmed in Malaysia for a brand new, 36km rapid transit line to be built on the outskirts of Kuala Lumpur. The new ‘Klang Valley LRT Line 3’ will begin construction at the beginning of next year, and is expected to open for revenue service in the year 2020. 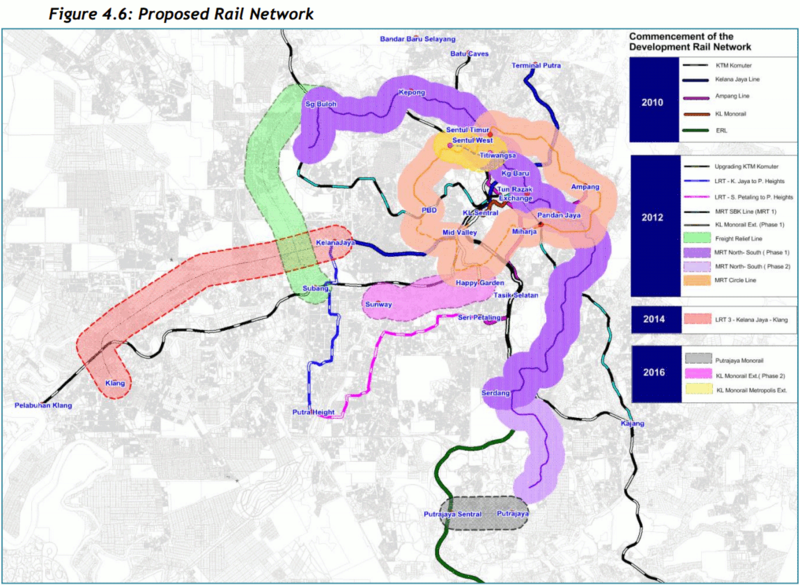 An alignment study has been completed, and the project owner has distributed the construction tenders just last week for the new line so that the detailed design process may proceed. Designed to ease traffic congestion in the Klang Valley and connected to the current LRT Kelana Jaya Line and the upcoming MRT Line 1 Sungai Buloh–Kajang, the proposed alignment of the LRT3 is currently being finalised by the Land Public Transport Commission. LRT3 aims to connect Bandar Utama to Klang, covering 36km, and will comprise 25 new stations. The Klang Valley line’s alignment is highlighted in red on the map towards the left. Note that while the original plan terminated the line at Kelana Jaya, the terminus has been changed to a new transit hub north of Kelana Jaya, where another connection is enabled to the proposed MRT 1 subway line. Daryl’s take reported on the Klang Valley Line last year, then known as the “Shah Alam Line” (SEE: Previous article) when its potential use of SkyTrain technology was merely a possibility. This has now been confirmed in the alignment studies. The environmental impact assessment for the Klang Valley/LRT3 project, which was uploaded by observers on the SkyscraperCity forum, mentions that the vehicles on the proposed transit line will be the “similar to those used on the Kelana Jaya line” – indicating that they will be the exact same vehicles or a close variant, using the same linear motor propulsion technology, and driver-less operation. The Light Rail Vehicle train, similar to those used in the Kelana Jaya LRT Line, will be used. The train can be configured to a 2, 4 or 6 car-vehicle train. The dimension of each car is 20 m long x 2.65 m wide x 3.44 m high. Each car will have a minimum of 36 seats and 6 passenger doors (3 doors on each side). It will be full Automatic Train Operation driverless system. While the assessment did not specifically mention the use of linear motor propulsion, it did specify a vehicle height of 3.44m, matching the vehicle height of the Mark II trains on the Kelana Jaya line and thereby requiring the use of linear motor “SkyTrain technology”, as the height would not permit standard rotary motor propulsion due to its requirement of a higher platform. As a comparison, the regional network’s Ampang Line trains, using standard rotary-motor propulsion, have a height of about 3.9m. The assessment also specified a 5% maximum grade, requiring linear motor trains for safe operation. For rapid transit rail lines, standard rotary propulsion trains are generally limited to 3% maximum grades in order to accommodate for push-pull operations in the event of train stoppages and other emergencies. At a whooping 36km from end-to-end, with 25 stations, the line will be the largest expansion of SkyTrain technology in recent history. I believe this will assuage some critics in Metro Vancouver who have claimed that the expense of SkyTrain technology prevents us from building larger-scale expansions. This is 36km of track being built at once, within 4 years! The new line will be designed to accomodate 6-car trains on platforms that are 120 m long – 50% longer than those used on the Expo and Millennium Lines. This will not be the first example of a SkyTrain technology transit line with trains longer than 4 cars (the Toei subway Oedo Line in Tokyo runs 8-car trains), but it may be the first done with Mark III trains if Bombardier is awarded the rolling stock contract. The line is being designed to meet projections of carrying 330,000 daily passengers by the year 2050, which will make it one of the busiest SkyTrain technology lines in the world – and possibly the busiest using Bombardier’s Innovia trains if those are used on the new line. Opening-day ridership is estimated at 70,000 riders. With the existing Kelana Jaya Line and its extension, the Klang Valley line’s 36km addition will result in over 80km of SkyTrain technology rapid transit in operation in the Greater Kuala Lumpur area. This will be the second largest network in the world, short of the Guangzhou Metro which is already operating over 100km of linear motor rapid transit and continues to expand that. If the rolling stock is provided by Bombardier, then RapidKL will surpass Vancouver’s SkyTrain to become host to the world’s largest SkyTrain technology system with Bombardier trains. 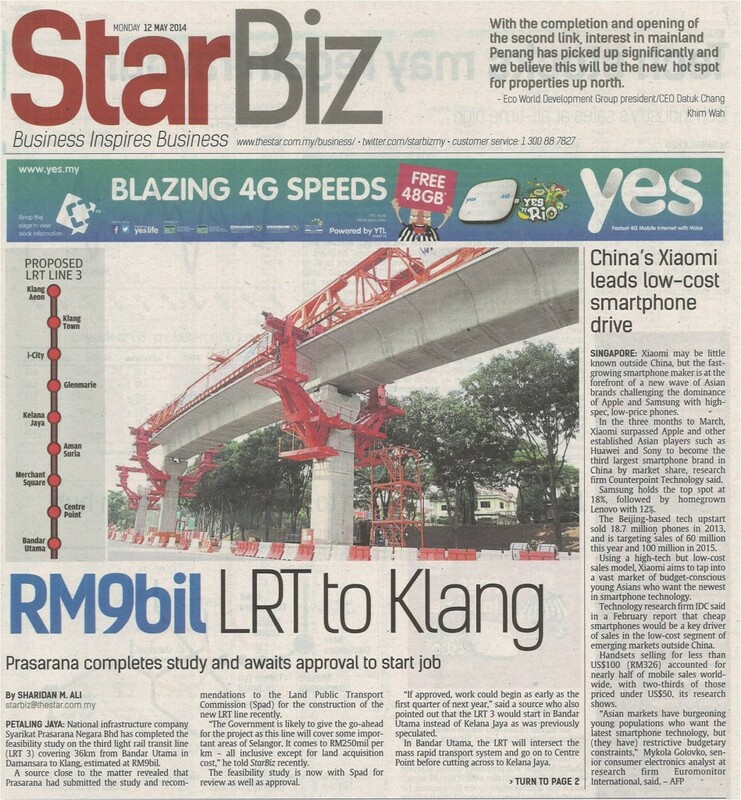 According to a recent news report, Chinese rolling stock manufacturer CSR-Zhuzhou, which has previously provided linear motor technology for the Guangzhou Metro and the Changsha Maglev, has bidded for the Klang Valley line in a consortium with local construction firm Naza Engineering & Construction. The Naza-CSR consortium have offered to fund up to 90% of the project cost, in an effort to lure the contract. If the consortium wins the contract, the trains will then be built by CSR-Zhuzhou rather than Canada’s Bombardier. They will still have to fit the specifications in the alignment study, meaning that linear motor propulsion trains – likely based on the ones in service in Guangzhou – will be used. A Naza-CSR win would mark the second time in history (the first being Tokyo) that a SkyTrain technology rapid transit system is operating vehicles from two different manufacturers, effectively debunking a commonly spread idea throughout this region that “SkyTrain technology”, which was originally developed in Canada, is proprietary. The Greater Kuala Lumpur region is familiar with CSR-Zhuzhou: they had previously provided rapid transit vehicles (of standard rotary propulsion tech) for the region’s older Ampang Line. A representative from Canada’s Bombardier Transportation (the manufacturer of our Expo and Millennium Line SkyTrain cars) has previously stated that the company is eyeing a train order for the proposed Klang Valley Line project, as well as other proposed heavy rail rapid transit projects throughout the region. Bombardier Rail opened a new office in Kuala Lumpur last year to facilitate operations in Malaysia and throughout Asia, accomodating 100 engineering, project management, systems integration and signalling specialists. If Bombardier bids for the Klang Valley line, they will then be in open competition with CSR-Zhuzhou and any other bidders for the line rolling stock. While we can’t seem to decide on transit projects or technologies here in Metro Vancouver, the Klang Valley region has progressed quickly and the project owner has already started the call for construction tenders. This is not just a proposal at this point – the consultations have been finished, and the project is moving forward. The line will be open for service just 5 years from today. 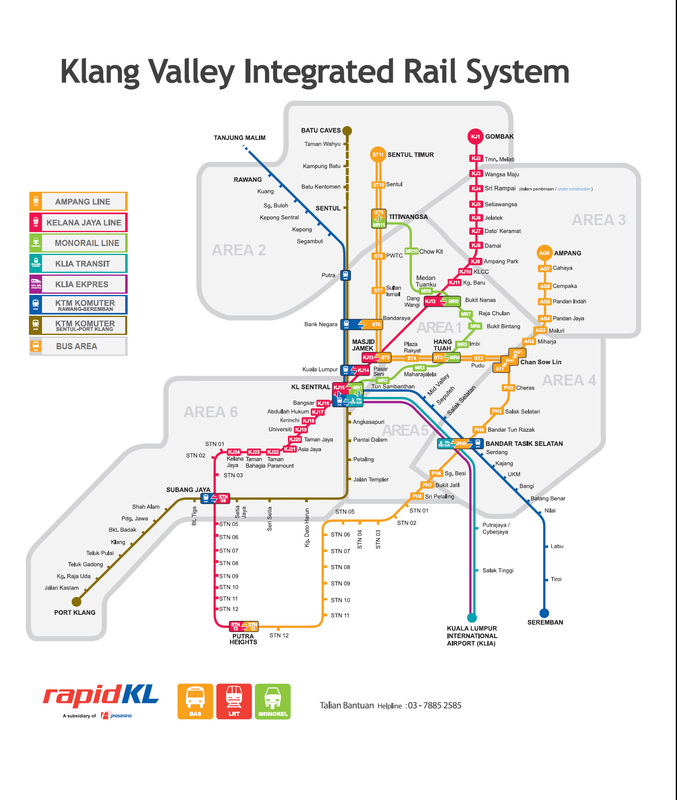 Kuala Lumpur’s integrated rail system. The Kelana Jaya line is in magenta. Kuala Lumpur’s RapidKL network is like a clone of our SkyTrain system overseas: the system is composed of several grade-separated, automated (driverless) rapid transit lines. Some use the same linear induction motor propulsion technology and Bombardier Mark II vehicles used on SkyTrain here in Vancouver, whereas others use standard rotary motor technology (as with the Canada Line). The Ampang Line, the first rapid transit line, used standard rotary propulsion and was opened in 1996. This was followed by the 1998 opening of the Kelana Jaya Line, the fully automated linear-propulsion line that looks and works exactly like our SkyTrain system, with the same Mark II trains. The 29km Kelana Jaya Line is built with both overhead sections and bored tunnel sections through the city core. It is the busiest and most popular rapid transit line in metropolitan Kuala Lumpur with 160,000 riders daily , and was for a long time the only rapid transit service in the Klang Valley metropolis that broke even (revenues paid for operations costs) until the Ampang Line, which had historically fallen a few thousand riders short from breaking even , was equipped with thec system to itself become fully automated (driverless) . Both lines are currently receiving extensions that are due to open at around the same year the Evergreen Line is opened here in Vanouver. This entry was posted in Global issues, Metro Vancouver transportation planning, Technology, Transportation and tagged automated rapid transit, BC politics, British Columbia, City of Surrey, driverless rapid transit, Examples, Greater Vancouver, issues, Kelana Jaya Line, Kuala Lumpur, linear induction motors, linear motors, Metro Vancouver, Metro Vancouver transit issues, public transit, rail, rapid transit, SkyTrain, SkyTrain tech, SkyTrain technology, technology, transit, transit planning, transportation, transportation planning, urban planning. Bookmark the permalink.